To catch our newer readers up to date, Linda & I were a test RV for Truma's tankless water heater back in 2014. We were one of about 30 RVs included in the test. 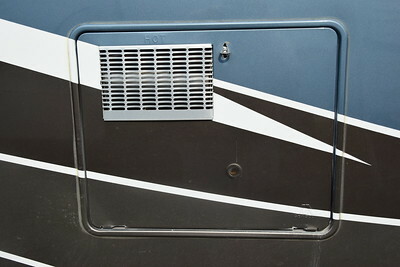 Truma International is a German company (founded in 1949 by Philipp Kreiss) that supplies heating and air conditioning products to the European RV market. In fact, they own about 80% of the market share in Europe. Mr. Kreiss named the company after U.S. President Harry Truman whom he admired for his reconstruction efforts after the war. 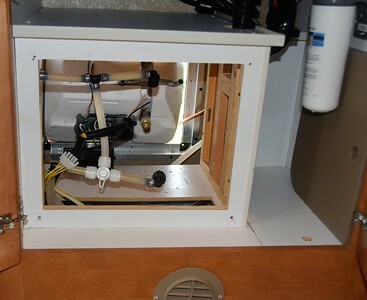 As far as being a test rig, we were skeptical at first, especially because there was nothing wrong with the Atwood water heater we had in the fifth wheel at the time. But, we quickly became fans, and we were asked to join them at the 2014 RVIA show in Louisville to talk to others about our experiences as consumers. 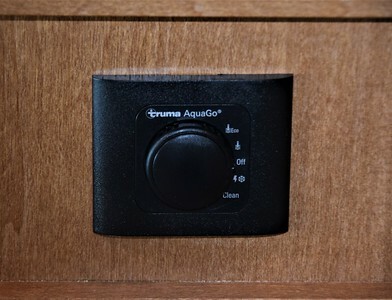 If anyone is interested, I wrote a long, detailed post about that first year working with Truma and the AquaGo here: RVIA Show & Truma. In 2015, we were excited to get a full-fledged production AquaGo. In October of that year, I wrote another post providing our opinion of the product: Truma AquaGo & LevelCheck. We certainly became spoiled by our AquaGo's unlimited hot water (limited only by your gray tank if you aren't on sewer hook-ups). And we determined we would likely put in the Comfort model in any rig we purchased in the future. 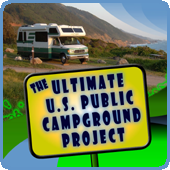 So, here we are with a new-to-us Class C motorhome and an Atwood 6-gallon water heater. Now, our gray tank is small, and even if we were on sewer hook-ups, leaving our gray tank open does us no good because the tank can only be emptied by pushing a button and pumping the water out. But we still like the quality and ease of maintenance of the AquaGo, so we were thrilled when Truma said they could install one this week. Our mobile installers arrived at our campground at 9:00 a.m. and immediately got to work. 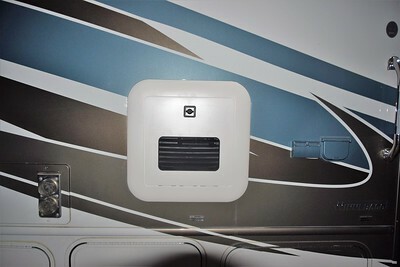 Here is the outside of the motorhome with the typical water heater exterior. Here's the Atwood with the door off. 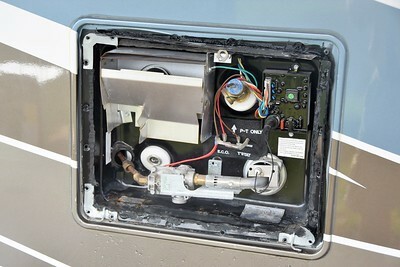 Don't get me wrong, the Atwood and Suburban water heaters installed in most RVs are good products. But the AquaGo is just better. 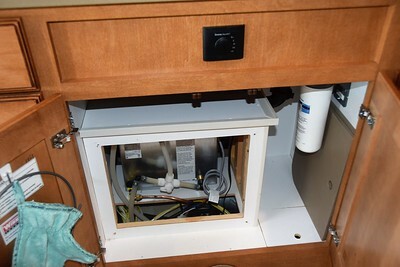 I removed an access panel to expose the interior side of the Atwood which was located under our kitchen sink. The tech started the disconnection process. After the propane, water connections, and electric connections were disconnected, here's what it looked like. Here's the AquaGo Comfort ready to be installed. 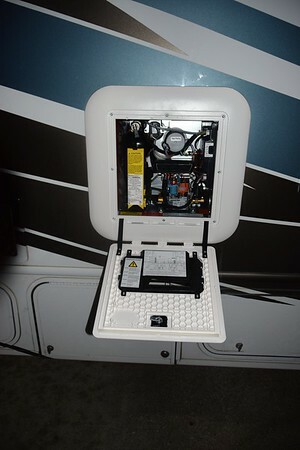 The AquaGo is designed to fit into the standard RV water heater spaces. And the black square in the wood in the photo above is the switch that wasn't available on our prior models. So, now there is an interior switch that turns the unit off and on and also allows us to choose the normal or Eco mode, whereas, we had to go outside to the unit to change modes on the one in the fifth wheel. The AquaGo runs only on propane, but it's efficient. The guys tested the unit, and we made sure we got hot water out of all the faucets - kitchen sink, bathroom sink, shower, and outdoor shower. They didn't have to give us too much instruction, but we chatted about Truma and the folks we know and have worked with. They were there about two and a half hours, and they said they usually allow two to three hours. David is out of their recently opened sales and service center in Lakeland, Florida, but just happened to be in Indiana this week. He also took care of registering our unit to make sure we get our full two-year warranty. Also, registration makes us eligible for the Owners Rewards Program. Upon registration, each owner can print out coupons like the one below, and each time a new unit is registered using the coupon, both parties get a $50 debit card. Click on the image below for a larger version. We were in a bit of a hurry when the guys finished, so I didn't get photos of the exterior right away. But here are a few shots from the outside, including the replacement door designed to cover the prior opening completely. They can't match the paint, but they have white, black, and other solid colored doors depending on what you think will look best. If you have any questions about the AquaGo, feel free to contact us. It's certainly a product that we recommend as a traditional water heater replacement or as an option from the manufacturer. 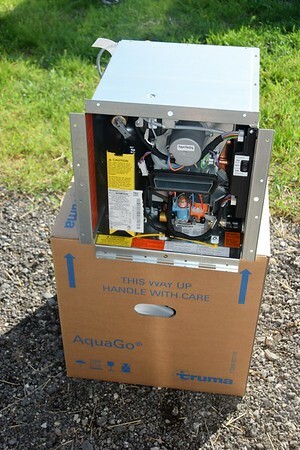 The Truma AquaGo can swap out any 6-16 gallon existing water heater. There are two models for this product, the Truma AquaGo Basic which is $1099.00 and the Truma AquaGo Comfort which is $1299.99. 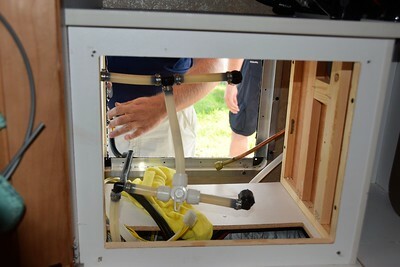 Installation cost depends on the dealer and how long it takes to install the product. Typically it takes about 3 hours to install and we have found the average hourly charge for dealers is around $120.00 per hour. Use Truma’s Dealer Search to find your closest Truma Certified Dealer. 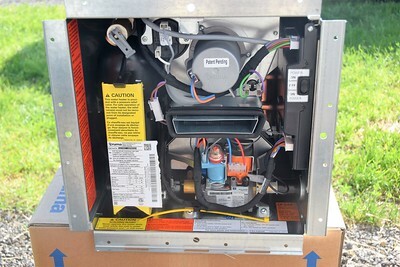 The Comfort model has a small reservoir called a "temperature stabilizer" that keeps some water heated at 102 degrees on normal mode and 41 degrees on Eco mode. 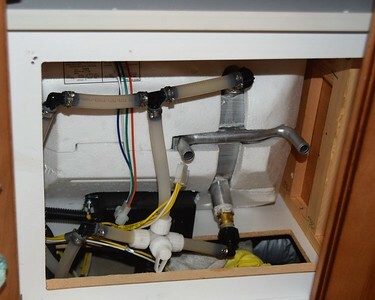 The Basic will take longer for you to get hot water out of the faucet (there is no water pre-heated in the temperature stabilizer), but it will be continuous once it gets hot (however, it doesn't have the freeze protection of the Comfort model because there is no temperature stabilizer.). I looked around, here and at their site, and I couldn't locate a price anywhere. How much? How much of your propane will this use when you are boon dockin? 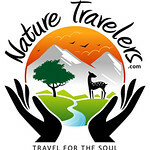 Being now that you can’t take your LP tank to get filled or at a RV park. I can't quantify exactly how much propane it uses, but it's not significant. The furnace uses far more propane. We keep our AquaGo on the "Eco" mode, so it uses less. In the normal "On" mode the flame ignites more frequently to keep the temperature in the small reservoir at 101 degrees. In the "Eco" mode, it only has to keep the water in the reservoir at about 41 degrees so it rarely used propane except when using hot water. The bottom line is that it doesn't use so much propane that we worry about it. Here is the official word I got from Truma.